• The City of Gainesville and Alachua County (the owners of the beautiful parks in which we climb) require that we provide them at least five (5) days prior notice to put on a tree-climbing event in their parks. Therefore, we cannot book a climb any sooner. We regret any inconvenience this may cause, but rules are rules. However, our booking system accounts for this so please feel free to book any available date and time that works for you. • If a date/time slot is unavailable, please choose one that is available. An unavailable date/time slot indicates that somebody already booked it, or we are traveling to host climbing events elsewhere. • Due to the demand for our tree-climbing events, we require a minimum of 4 people to book a Canopy Climb. We are not in a position to fill in spots for your group. All Canopy Climbs are "private events," meaning that we host only you and your friends and family for your own personal climbing event. Again, we are not in a position to put different groups of climbers together. • It is the purchaser's responsibility to share with their group, information regarding when and where to meet, and links for the Registration and "Be Prepared" pages. This necessary information can be found in the automatic emails the purchaser will receive upon booking an event. Then, 4 days before the event, the purchaser will get another automated reminder email with the same necessary information. Again, it is the purchaser's responsibility to share this information with their entire group of participants. • All participants must sign the required liability waiver and pre-register before they are permitted to climb trees. • All participants agree to wear proper safety gear at all times while in the activity area. • All participants agree to listen to and follow instructions at all times while in the activity area. • All participants agree to be respectful to people and trees, especially while participating in our tree-climbing event. • All participants agree to our Cancellation Policy and Rescheduling Policy (see below). • For the safety of our clients and guests, Canopy Climbers reserves the right to enforce our rules and safety standards at all times. We reserve the right to refuse admission and/or participation to any person, participant or guest we deem unfit to participate, uncooperative or disruptive during an event. • We reserve the right to ask anyone to leave the activity area, and/or property, at any time and for any reason we deem necessary. Any person who demonstrates disruptive, disobedient, disrespectful, dangerous or uncooperative behavior, and/or refuses to follow instructions will be asked to leave the activity area. • We reserve the right to, at any time, move any Canopy Climbers event to a different location due to scheduling issues, weather, maintenance and/or safety reasons. We will do our very best to communicate and accommodate our clients in this kind of situation. ALL TRANSACTIONS ARE FINAL AND NON-REFUNDABLE except for advance weather-related cancellations, a decision that will be made only by Canopy Climbers. If Canopy Climbers finds it necessary to cancel your event for safety or weather concerns in advance, Canopy Climbers will reschedule your climbing event at no additional charge. Once your climbing event begins, there are no refunds for weather related cancellations or disruptions. Only Canopy Climbers can cancel an event due to safety matters, weather conditions or other factors. Canopy Climbers reserves the right to pause or cancel any and all tree-climbing activities due to safety situations, weather conditions or any other reason we deem fit. Canopy Climbers also reserves the right to, at any time, change tree-climbing venues or locations for the safety, comfort and benefit of our guests. If you cancel your event, you will not be refunded. If you do not show up, you will not be refunded. If you are late, we will still end the climb as scheduled. Things happen. So if you need to reschedule to a different time and/or date, please contact us at your earliest opportunity so we can try to fill the time-slot that is currently being reserved solely for you and your event. Your account will be charged a $49- rescheduling fee. Please do not try to reschedule your event within 24 hours of the start time. Within 24 hours of your climbing event, we consider “rescheduling” to effectively be a "cancellation." And you will not be refunded for canceling. We start prepping for your climbing event at least a day in advance. If Canopy Climbers finds it necessary to cancel your event for safety or weather concerns in advance, you can reschedule your event free of charge. However, if it is not possible for you to reschedule your event, then you must request a full refund, via email, within 1 week after your canceled event. Please briefly explain your unique circumstances regarding why you cannot reschedule. If inclement weather causes your class to be canceled, we will postpone and reschedule for a mutually agreed-upon date. Photography services are not included in our tree-climbing events. During our events, we may take photographs that may be used for advertising and marketing purposes in accordance with our Liability Waiver and Photo Release. These photographs are solely owned by Canopy Climbers and we reserve all rights under copyright law. Our photographs are not for sale and will not be given to or shared with our guests directly. We welcome our guests to share, repost, tag, download or print any images we’ve posted online, as is. We prohibit anyone from altering, editing or cropping our photographs in any way, including removing our watermark, as this would be a violation of our copyright-protected property. We make no promise or guarantee that we will take, post or share any photos for any given event. We encourage our guests to take as many still photos as they wish during their tree-climbing event. We reserve the right to prohibit or limit video recording during any of our events. 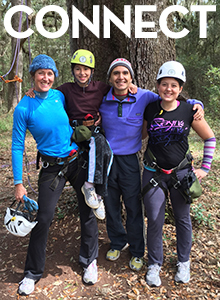 Our guests are welcome to hire a professional photographer to document their climbing adventure. Any such arrangements are subject to Canopy Climbers rules and policies.